Back to Work Hjoki. Male, born: 12/2008. Health results: HD:A, ED:O, Eyes clear. PN: free. Sizes: 63 cm, 35-38 kg. Swedish kennel club registration number: SE43700/2014. Working results: Command lead dog during races: Eastpoint Open 200 km 2014 and Eastpoint Open 300 km 2015. Many years mid distance tours at Laplands woltrail. 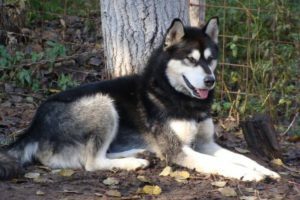 Excellent worker, very good trotter, high drive, very nice and non aggressive temperament toward people and all dogs both females and males. Joki has a so called ‘RISH’ pedigree. 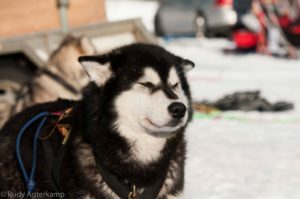 This means that Joki is recognized and certified by the FCI as an Alaskan Malamute, but his background is officially unknown. 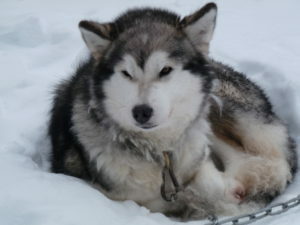 But I am the breeder of Joki and I kept an own pedigree up to 4 generations. 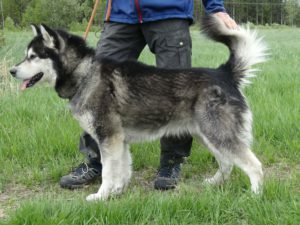 Joki’s offspring are FCI registered malamutes with one generation on their pedigree. 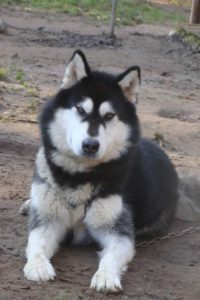 With his offspring you can breed officially FCI registered dogs, but they can’t get a show champion title until the offspring pedigree is complete with 3 generations. Joki’s brothers and sisters are working and living with us. Chicco (closest to camera): Male. 63 cm at shoulders, 35 kg. Finished 200 km at Eastpoint Open in 2014 and 300 km at Eastpoint Open in 2015. Run in all positions. Working trotting speed: 8-16 km/hour. excellent worker, very good trotter, good feet, high drive, non aggressive temperament. Tromso: (closest to car) Male. 58-59 cm at shoulders, 30 kg. Finished 200 km at Eastpoint Open in 2014, 300 km at Eastpoint Open in 2015 and 300 km at Gold Rush Run in 2017. 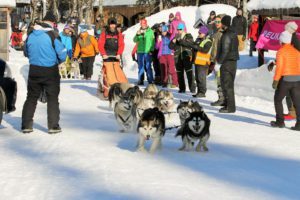 Lead dog. Working trotting speed: 10-17 km/hour. Excellent worker, very good trotter, good feet, high drive, non aggressive temperament. T.Bet: Female. 59 cm at shoulders, 27 kg. Finished 100 km at Eastpoint Open in 2014 and 300 km at Gold Rush Run in 2017. 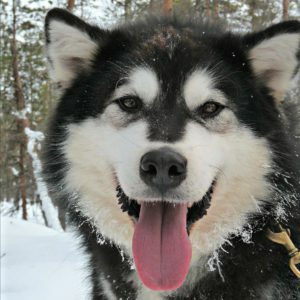 Lead dog. Working trotting speed: 12-17 km/hour. Uses all gates, excellent worker, high drive, very dominant but non aggressive temperament. 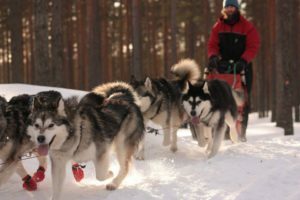 Bamse: (Female with the booties) 57 cm at shoulders, 27 kg. Finished 200 km at Eastpoint Open in 2014, 300 km at Eastpoint Open in 2015 and 300 km as main leader at Gold Rush Run in 2017 and 2018. Lead dog. Working trotting speed: 8-14 km/hour. Very good trotter, excellent worker, good feet, high drive, non aggressive temperament. Jef: Male. 58 cm at shoulders, 29 kg. Finished 100 km at Eastpoint Open in 2014, 300 km at Eastpoint Open in 2015. Run in all positions in team. Working trotting speed: 8-13 km/hour. Very good trotter, excellent worker, good feet, high drive, non aggressive temperament.